Identity&Security proposal for SOA Repository(Guvnor). Created by Jeff Yu on Mar 5, 2009 11:46 PM. Last modified by Jeff Yu on Mar 6, 2009 1:09 AM. In the Guvnor, we are going to use the Role based access control to do the authorization. The roles management are quite similar to what we did for users, here are the screenshots. We have two ways to associate the resource permissions to roles. Firstly, As we saw in the roles form editor, it will list all of available resource + operation in a set of checkboxs, like "Read ESB artifacts". We can see it like category. If you grant the 'Read ESB artifacts' operation permission to a role, then it can read all of ESB artifacts. In this way, I think the security feature can be very flexible. 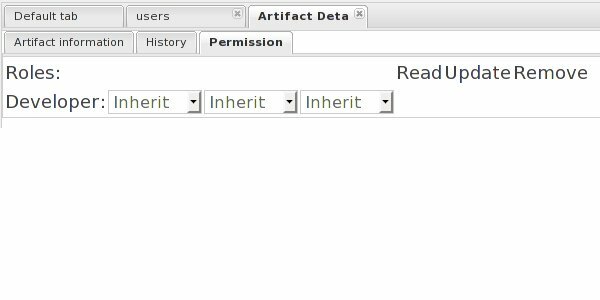 although I don't expect users will use the specific artifact permission feature often, I would say it adds our security feature's flexbility. Note: The UI might be subject to change in the implementaiton, but the whole idea (especially in authorization part) would be the same.